Welcome to my website! I've been creating jewelry since 1981 and specifically dichroic glass for over 20 years. One of a kind pieces are available through this website . My work is carried by 35 galleries across the US, including The Corning Museum of glass, Seeker's Glass Gallery in Cambria,Ca and Rumors in New Orleans. 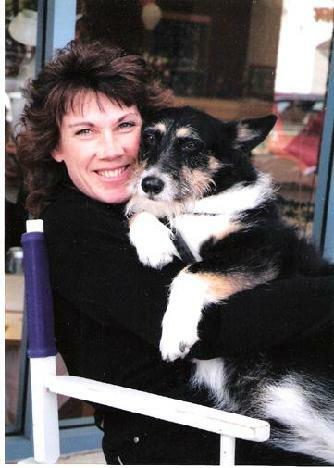 Kim Kole and one of her 4 dogs "rita"
WHILE COMPLETING HER BS IN ART EDUCATION KIM STUDIED METAL WORK. CONCENTRATING IN GOLDSMITHING, SHE APPRENTICED UNDER MARTIN DUBLER OF THE FAMOUS 18K STUDIO IN ATLANTA. DRAWN TO CALIFORNIA BY THE BRILLIANT COLORS IN THE NATURAL ENVIRONMENT KIM MOVED IN 1984. SHE BEGAN WORKING IN DICHROIC GLASS CREATING UNIQUE JEWELRY. EACH PIECE IS HAND CUT AND METICULOUSLY STACKED AND PLACED IN THE KILN FOR FIRING. HER EMOTIONAL RESPONSE TO THE DEPTH AND INTENSITY OF COLOR, ENHANCE THE COMBINATIONS OF LAYERED AND PATTERNED GLASS. GALLERIES HAVE BEEN CARRYING HER WORK SINCE 1987.USING HER BACKGROUND IN OUTSIDE SALES KIM BEGAN SHOWING IN JURIED ART FESTIVALS THE FOLLOWING YEAR. THIS FULL TIME OCCUPATION KEEPS KIM BUSY STOCKING OVER 50 GALLERIES AND TRAVELING TO 8 TO 10 FESTIVALS A YEAR.SHE ENJOYS HER CLIENT CONTACT AND DESIGN CHALLENGES.